Paul and Kaity Siegel did not want Sept. 11, 2001, to be forgotten. While others might hang a plaque or get a tattoo, the Siegels created a corn maze in Lockport to commemorate the 15th anniversary of the terrorist attack in New York City, Washington, D.C., and Pennsylvania. 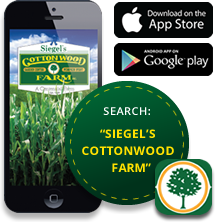 They own Siegel’s Cottonwood Farm, 17250 Weber Road, Lockport. 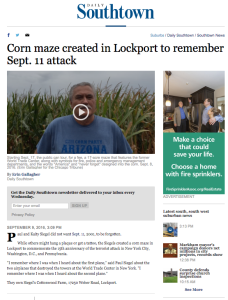 Starting Sept. 17, the public can tour, for a fee, a 17-acre maze that features the former World Trade Center, along with symbols for fire, police and emergency management departments, and the words “America” and “never forget” designed into the corn. Paul Siegel, who is a Lockport Fire District trustee, said he got the idea in 2011 when only a handful of people attended a south suburban ceremony honoring 9/11 anniversary. “It seemed like everybody had forgotten,” he said. The next year, the farm, which has had a maze during its annual pumpkin fest since 1990, offered a weekend of free admission to all first responders and their families. This year, they are opening a week earlier than usual, and offering a military appreciation weekend, which is free admission to all active and retired military personnel and their families. Sept. 24 and 25 will be free for first responders. “America won’t forget,” he said. Paul Siegel said the maze was created by first double planting the seeds, north to south, followed by a second planting east to west, in order to create a dense population of 45,000 stalks. After a design was drawn on paper and a computer, the stalks were spraypainted to indicate what needed to be removed. After the stalks were removed, the Siegels tilled pathways. Cottonwood Farm is open at different times of the year for different scheduled activities, including selling vegetables all summer. It is in the autumn when the farm turns into a mini-theme park for the annual pumpkin festival, with train rides, animals, puppet shows, forts and ladders. The annual pumpkin fest is an attraction for families the Siegels call “agritainment” because it teaches about a farm’s food and animal production. New this year is Kaden’s Birdie Barracks, which are red cedar play forts built like birdhouses and named after the Siegels’ grandson. “Most of our attractions are named after our grandkids or our kids,” Paul Siegel said. The 40-acre Cottonwood Farm was bought by Paul Siegel’s grandparents, Frank and Gertrude Siegel in 1909, making it a four-generation centennial farm. Admission is $15 on weekends and holidays, and $12 weekdays. Children age 2 and younger get in free. The fest is open daily 10 a.m.-6 p.m. from Sept. 17 to Oct. 31.